The Xerox AltaLink C8030 Multifunction Printer comes at a great price and producing up to 30 pages per minute, for printing color or black-and-white documents. This copier is great for small businesses and teams in order for them to be able to manage their day to day tasks easier. Help your team stay efficient with the Xerox C8030. The Xerox AltaLink C8030 MFP can print, scan, copy and fax. With MFP you have the ability to deliver bright business color copies and finishing options in order to add that extra impact! With this feature it makes it possible to get more work done in your office so that you do not have to outsourse those tasks any longer. 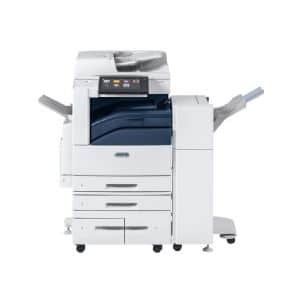 The Xerox AltaLink C8030 MFP in Fort Worth is very adaptable to your business environment. It allows for you to use the equipment you already have in your office to install and start using right away for all of your needs. Along with all of your many challenges, don’t let a copier be one of them! Get started today solving all of your small business needs with this Xerox AltaLink C8030 MFP. Call us today and we will help you with any questions you may have on this copier or any other copier that Xerox has available.